LJ has started publishing FOAF information for all its users. The main use of this is obviously to draw pictures. Click the small piccy for a bigger one. Purdy, ain’t it? 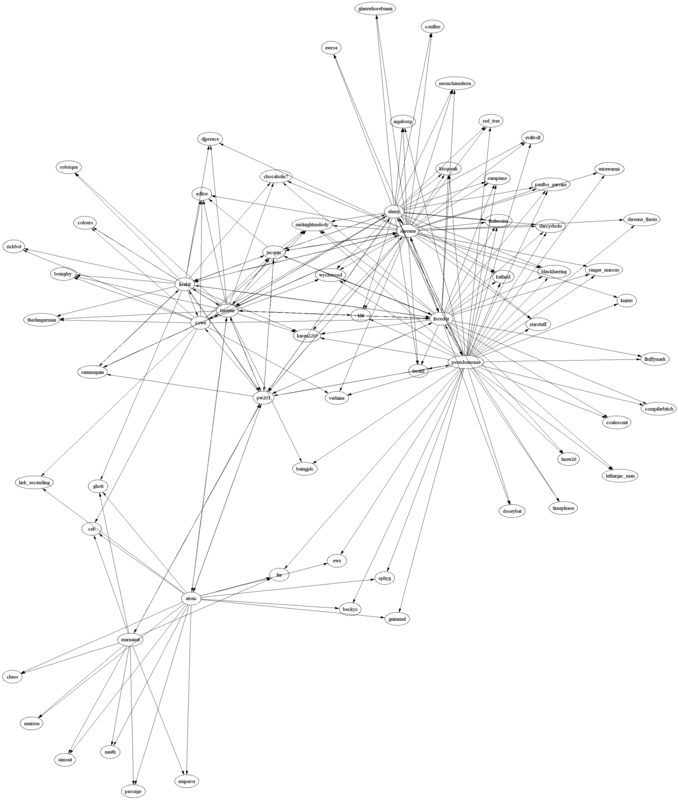 This is a graph of the connections out to friends-of-friends level. Anyone at friends-of-friends level without at least 2 lines into them was pruned. The graph came from GraphViz, the data from LJ using a Python script and rdflib. I’m not desperately keen on unleashing the script on an unsuspecting world, as it doesn’t do polite things like caching fetches between runs (although it doesn’t fetch the same person twice in a single run), but if you’d like to see it, let me know. I also went through the names on PaulB’s photo page and produced another graph from memory, but it’s much less connected than I remember. Anyone know what happened to the original? I’m talking to livredor in her journal entry called Christianity confuses me! Most of the action is currently somewhere around here. My position is that Christianity confuses me, too, so much so that my grammar goes to pot (well, it’s late). sitecopy now fulfills my FTP uploading needs, enabling me to maintain my websites without mucking about with Perl or Python scripts. It can be made to look at the files’ hash values rather than modification times, so the BINS program’s habit of regenerating all the thumbnails every time it runs won’t cause sitecopy to upload them all again. Which is nice. PaulB has pictures of me singing at terriem‘s birthday party. I remember doing “Lady in Red”. I will protect them, because I am Chris de Burgh. To take basic safety precautions. I have finished Norman Cohn’s Cosmos, Chaos and the World to Come and started on Anita Diamant’s The Red Tent . Cohn says that the early Jews were polytheists who saw the God of Abram as their god but didn’t deny the existence of other gods. It’s interesting to see this played out in the fictional lives of Jacob’s wives in Diamant’s book. I’ll review both of them at some point. It appears I am either The Backrubber or the The Slow Dancer, depending. I did the quiz twice and came out with different answers. Vote now. Mailinator is handy for addresses to give to meme-hosting sites. I had an excellent birthday party. Thanks to everyone who came along, and to S for helping with it and keeping me sane. There were so many guests I found I’d not bought enough food, but the pizza delivery people came to the rescue. The Churchill, CDC and Drogon people intermingled by the end, which makes it a success in my book. I blew out 28 candles. It’s downhill all the way from here. Static page generation (so not PHP and the like). Only touching image files which actually need to change. I’ll probably upload them to NTL, and the script to do that works out what it really needs to upload using the file modification times. I can fake this if necessary, but it’s inelegant. Written in some scripting language so I can hack it about easily. The winds seem to have blown away the old. And blown a tile off the roof, but change isn’t always easy.